The female reproductive cycle begins at puberty. Each reproductive cycle starts from the day of menstruation and last an average of 28 days. It consists of a sequence of changes that occur in the ovaries and uterus. During each reproductive cycle, Gonadotropin Releasing Hormone (GnRH) from the hypothalamus stimulates the anterior pituitary to release two gonadotropic hormones: Folicular Stimulating Hormone (FSH) and Luteinizing LH. The target organ for these two hormones is the ovary. Each female reproductive cycle has two components: the ovarian cycle that takes place in the ovaries and the uterine cycle that takes place in the uterus. Both the cycles occurs over a period of 28 days and are in synchronization with each other. The Ovulation occurs on the day 14 of the 28-day reproductive cycle (ovarian and uterine cycle). Based on the date of ovulation both ovarian cycle and uterine cycle are in turn sub-divided into sub -phases. Ovarian cycle: The ovarian cycle consists of a series of changes in the ovarian follicular cells that result in ovulation and formation of corpus luteum. In the ovarian cycle, the 14 days prior to ovulation are known as the follicular phase, while the 14 days following ovulation constitute the luteal phase. The ovarian cycle is regulated by changing levels of FSH and LH. Uterine Cycle: It comprises of a series of changes in the uterus that occurs every during menstrual cycle in preparation for a possible pregnancy. 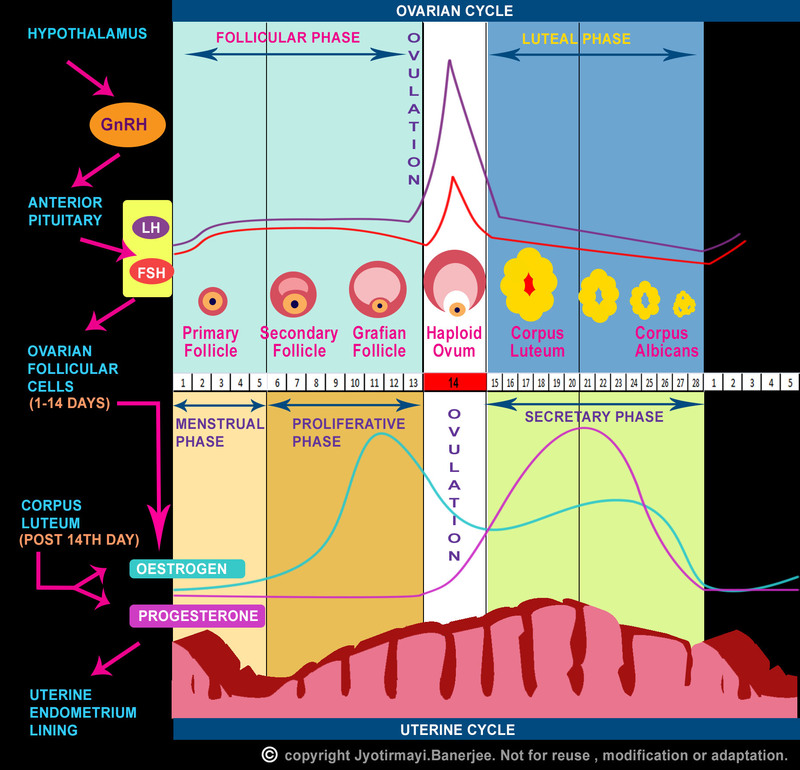 In synchronization with the Follicular Phase, the first 14 days prior to ovulation are subdivided into menstrual phase (days 1 to day 5) and a proliferative phase (days 6 to 14). The 14 days after ovulation constitute the secretary phase. The uterine cycle is controlled by the ovarian hormones – Estrogen and Progesterone. Ovaries: The events in the ovary prior to ovulation constitute the follicular phase of the ovarian cycle. In the first five days, increased GnRH stimulates the anterior pituitary to increase production of FSH and LH. This stimulates primordial follicles in the ovary to mature into primary follicles, each containing a diploid primary oocyte that is in cell division arrested state (in prophase I of Miosis I). Uterus: At the same time in the uterine cycle, decreasing levels of progesterone lead to sloughing, or shedding, of the endometrial lining. This is the menstrual phase, commonly referred to as a woman’s period. Ovaries: In the ovary during the second part of the follicular phase (days 6-13), a small number of primary follicles form secondary follicles. About two days before ovulation, under the influence of increasing levels of LH and FSH, the follicles expand to form a swelling on the surface of the ovary. Approximately 16 hours before ovulation, the levels of FSH and LH surge to cause the final maturation of the follicle, now called a grafian follicle. Just prior to ovulation, the primary oocyte completes meiosis to form a haploid secondary oocyte. Uterus: Simultaneously, the lining of the endometrium begins to reform under the influence of oestrogen produced by the ovarian follicular cells. This is known as the proliferative phase of the uterine cycle. Ovaries: As the level of LH peaks, proteolytic enzymes produced in the follicle causes its walls to weaken and rapture. Ovulation is the release of the secondary oocyte from the mature follicle. Uterus: The uterine lining continues to thicken in anticipation of possible implantation. Ovaries: After ovulation the ovary enters the luteal phase of the ovarian cycle, days 15-28. During this period, the remaining ovarian follicular cells form a corpus luteum, which produces the hormones Progesterone and Estrogen. Uterus: Progesterone and estrogen from the corpus luteum stimulate further thickening of the endometrium in the secretory phase of the uterine cycle. If fertilization and implantation occur, cells at the implantation site in the uterus begin to produce Human Chorionic Gonadotropin (HCG). HCG prevents degeneration of corpus luteum so that elevated progesterone and oestrogen levels are maintained to prevent shedding of the uterus lining at the end of the uterine cycle. After 8-12 weeks the corpus luteum ceases to produce progesterone and estrogen and degenerates to become the corpus albicans. The placenta in the uterus replaces the corpus luteum in producing progesterone and estrogen. If fertilization doesn’t occur the corpus luteum becomes a corpus alibicans by the end of the cycle. This leads to decreased levels of progesterone and estrogen and results in menstruation and the beginning of the next uterine cycle.